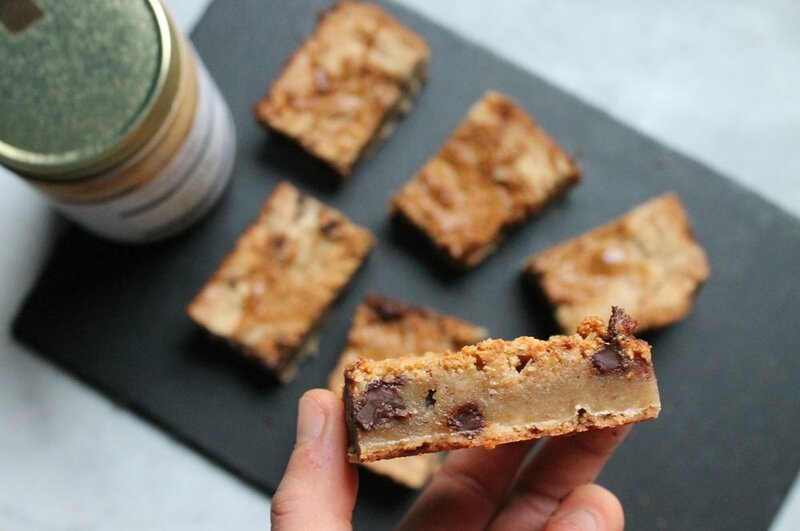 This recipe is a delicious (dairy-free) spin on the classic blondie recipe! We love our Salted Eggnog holiday flavor for this one, but any of our nut butters would be delicious! Preheat oven to 350 F + grease a 8” x 8” pan. Melt coconut oil in a large bowl. Mix in 1/4 cup Salted Eggnog nut butter + brown sugar. Mix in eggs, vanilla + almond milk. Stir in flour, cinnamon, clove + nutmeg until just incorporated. Pour batter in pan, spreading it out evenly. Spread the remaining 1/4 cup Salted Eggnog nut butter on the top of the batter, in parallel lines. Using a knife or toothpick, create lines in the batter in the opposite direction, so a criss-cross pattern appears. Bake for 25-28 minutes. You’ll know it’s done when the edges are golden brown, the top is firm + a toothpick comes out clean.